Double Ball Roulette – a New Way to Play! If you are an avid casino player, or simply enjoy the occasional game, then chances are you are well acquainted with the traditional games roulette live that are usually offered, to the point where you may even be tired of playing them. If you want to take a break from your usual games, or you simply want to try something new, then the double ball roulette might be the solution. Roulette is an extremely widespread gambling game, with a lot of modern variations appearing in casinos, meant to attract long-time players who want a change of pace. While the double ball roulette is only a couple of years old, as opposed to the original, time-tested formula which first appeared in 1655, it seems that a lot of avid roulette players have taken a liking to it, leading to its adoption in many casinos and online gambling sites. Therefore, if you cannot play the double ball casino anywhere near you, you can easily access an online game. There are also multiple videos online explaining the game, and showcasing gameplay if you do not want to try the game out first hand. As the name suggests, the double ball roulette is simply a variation of the well-known roulette game, but with two balls instead of one, bringing fresh and unique changes to the classic formula. One such change is the appearance of new mechanisms involved in play. Given that launching the balls at the exact same time would be almost impossible for a human, the balls are placed into a small device called a ball feeder, which releases the balls simultaneously at the push of a button. The device is part of an attachment that wraps around the usual roulette wheel. A high number of the play rules of regular roulette also apply to double ball roulette. The game begins with everyone placing their bets. However, as there are two balls in this game, the betting rules are also modified. For inside bets (betting on one number), you only need one of the two balls to fall on your selected number in order to win. For outside bets (betting on a color), you need both balls to fall on the color you have chosen in order to win. In order to win the Double Ball Jackpot, both balls need to fall on the same number. After all bets have been placed, the croupier places the balls in the ball feeder, and hands the remote control to a random player. Upon pressing the button, the ball feeder simultaneously releases the balls, which fall onto certain numbers, like in normal roulette. After the balls have stopped moving, the winners are paid by the croupier. After cleaning the chips off the table, a new round starts. Because of the addition of a second ball into play, this roulette variation gives you a plethora of ways to win, with higher chances for inside bets, and higher payouts for outside bets, or for the elusive jackpots. Playing double ball roulette isn’t a guarantee that you will win: the estimated probability of winning is still extremely small, with your chance of hitting the double ball jackpot being 0.000693. 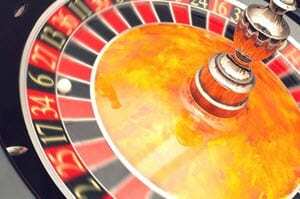 In fact, calculating the odds may surprise you, as it has reduced odds compared to the standard roulette. However, what the double ball roulette lacks in odds, it makes up with its entertainment value, and its chance of hitting the huge jackpot. If the double ball roulette is not to your liking, then you shouldn’t be discouraged: there are plenty of other variations available both online and offline, and if all else fails, you can always rely on the classic formula. Play at double ball roulette Now !